This week's topic for Illustration Friday inspired me! I knew what I wanted to say, but wasn't quite sure how to say it at first. It's about how I feel about nature and this country in particular - the sense of how the earth flows up through the soles of your feet. When I was young I went through a phase of wanting to include elements of indigenous Koori (Australian aboriginal) elements into my work, but felt as though it was a form of cultural appropriation and so desisted. Recently, I found out that I am actually partly aboriginal - my great grandmother (my grandmother's mother) was indigenous! This information was apparently concealed by some family members :(. I always knew about my celtic, anglo-saxon and gypsy heritage, but I am very pleased to now know this part of where I came from as well. I've made no attempt at a perfect picture - I just scribbled out a foot in pencil then, on another piece of paper, inked all the swirly lines, combined the two in Paintshop and coloured it. With the colour, I tried to overlay transparent colours on the foot and the background, to get the sense of underlying colours coming through. thanks for sharing a part of who you are and i think you have also enjoyed digging up and knowing them and doing the illustration. I enjoyed the strong colors and the conception of your idea. Good work! this is the best illo for Roots...at least from my point of view. the combination of colour are great! truly different from the rest of the illos i've seen so far. My initial reaction to this piece (before I read your explanation) was twofold...first I thought, "Wow, this looks really different from his other stuff...very abstract" and then I thought it looked like an Aboriginal painting. That's just very cool that you were able to combine some of your heritage with a form you've been interested in. I really like the whole feeling, mood, and visual aspect you've achieved with this; the colors are almost pulstaing, and the glow around the tree trunk gives it the feeling of energy. Well done ! oh great colors! liked the way you used them on the roots inter-twining each other. cool way of combining different mediums and a great concept too. One thing about commenting late is others say the right words first :) The colours are vibrant with life and shapes full of energy. Really well done and I see this as a continuation from thoughts you had last week! Fantastic! I love those colorful roots! It's making my feet tingly just thinking about it! WOW, you know I love the colors, they work very well to give importance to the roots. 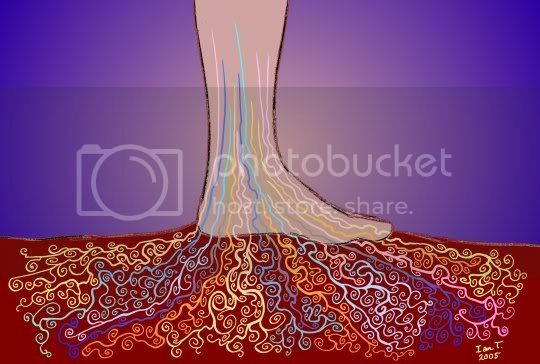 And the idea of the roots going up to the foot is a wonderful representation of the theme. I enjoyed reading about your family background. I know that I was never big on history, but several years ago I started looking into my genealogy and that was a spring board for finding out about my family's and my country's history. Small personal histories seem more real and significant than text book history. Really terrific in both content and execution. How interesting to hear your story. GREAT colors...and best of all, it looked like you had a fun time with it. Bravo! I love the decorative look of this and the way you incorporated the aboriginal theme. I love the colors and all the swirls! This is such an interesting interpretation and it's so well done too! Just cruised by this one and was struck by it. I, too, am strongly drawn to the art of the local indigenous people (Northwest native art) but feel weird borrowing it (nothing First Nations about me unfortunately). very nice...love the roots...and those colors! I enjoyed reading through your blog. You have quite some interesting topics. To further expand your content on your blog, try visiting mine at Genealogy Search. Maybe it will help one of your visitors to find a relative from the past or to look up ancestors. Thanks!